The Northern Ireland Civil Service (NICS; Irish: Státseirbhís Thuaisceart Éireann; Ulster-Scots: Norlin Airlann Cïvil Sarvice) is the permanent bureaucracy of employees that supports the Northern Ireland Executive, the devolved government of Northern Ireland. An additional Ministry of Health and Local Government was formed in 1944, in preparation for the National Health Service and other aspects of the welfare state. In 1965, that department was split between the Ministry of Health and Social Services and the new Ministry of Development. A further Ministry of Community Relations was established in 1969, in response to the early stages of the Troubles. 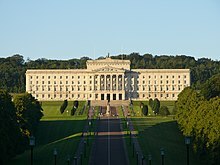 The Parliament of Northern Ireland was dissolved on 30 March 1972, when direct rule was imposed by the United Kingdom Government. The Secretary of State for Northern Ireland assumed responsibility for government and was assisted by a new Northern Ireland Office. The NIO absorbed the Ministry of Home Affairs and took direct responsibility for security, justice and constitutional policy. The Executive collapsed due to the loyalist Ulster Workers' Council Strike and direct rule resumed. The Troubles continued in the absence of a political settlement. Between May 1974 and December 1999, departments were led politically by junior ministers in the Northern Ireland Office. UK Governments alternated between the Conservative and Labour parties, neither of which included Members of Parliament from Northern Ireland. The Northern Ireland Civil Service, uniquely in the British Isles and Western Europe, was not accountable to locally elected political representatives during this time. The Good Friday Agreement (April 1998) led to the formation of the Northern Ireland Executive (accountable to the Northern Ireland Assembly) on 2 December 1999, which ended 25 years of direct rule. The Executive was suspended several times due to political disputes (notably from October 2002 to May 2007) and each suspension resulted in the return of direct rule. Devolution was restored on 8 May 2007 and was partially interrupted in late 2015, due to the resignation of Democratic Unionist Party (DUP) ministers due to alleged Provisional IRA activity. The number of departments increased to 11 (and ministers to 12) when the Department of Justice (abbreviated to DoJ) was created on 12 April 2010. The Northern Ireland Office continued in operation, representing the interests of the United Kingdom Government in Northern Ireland. The Northern Ireland Executive ceased to operate in January 2017, following the resignation of Martin McGuinness (Sinn Féin) as deputy First Minister during a dispute between the DUP and Sinn Féin over the Renewable Heat Incentive scandal. An early election to the Northern Ireland Assembly took place in March 2017 but the Northern Ireland Executive was not formed afterwards due to continued disputes between the DUP and Sinn Féin. Each department is currently led by a Permanent Secretary, or the Head of the Civil Service in the case of the Executive Office. The Permanent Secretaries Group meets monthly and effectively the highest level of government in Northern Ireland in the absence of the Executive. Other major public sector employers included National Health Service trusts (68,263), schools, colleges and education and library boards (65,514), local government (12,134) and the Police Service of Northern Ireland (10,542). The public sector constituted 31.3% of the region's workforce. The Civil Service Commissioners for Northern Ireland are not civil servants and are independent of the Executive. The Commissioners are responsible for ensuring that appointments to the Northern Ireland Civil Service are made on merit on the basis of fair and open competition; they also have a role in hearing appeals made by existing civil servants under the Northern Ireland Civil Service's Code of Ethics. Under the Code of Ethics, each civil servant is expected to carry out his or her role with dedication and a commitment to the Civil Service and its core values: integrity, honesty, objectivity and impartiality, defined as follows. The code also outlines the standards of behaviour expected in carrying out the role in accordance with each of those values. Each grade has a number of different disciplines (e.g. General Service, Professional & Technical etc.). Civil servants in the Industrial staff group have many different grades that are split into pay groups for undertaking similar types of work e.g. road workers in the Department for Infrastructure or craft grades in DAERA. ^ "Membership of the Permanent Secretaries Management Group". UK Government. ^ "Sir Peter Ricketts, Permanent Under Secretary, Foreign and Commonwealth Office". UK Government. Archived from the original on 21 November 2008. ^ "The Departments (Northern Ireland) Order 1982". ^ "The Departments (No. 2) (Northern Ireland) Order 1982". ^ "DUP ministers will be reinstated and resign again". RTÉ News. 11 September 2015. Retrieved 16 October 2017. ^ "The Departments (Northern Ireland) Order 1999". ^ "Fresh Start Agreement". www.gov.uk/nio. Northern Ireland Office. 17 November 2015. Retrieved 16 October 2017. ^ Hughes, Laura (16 January 2017). "Snap election announced in Northern Ireland as power-sharing agreement collapses". Daily Telegraph. Retrieved 16 October 2017. ^ "Permanent Secretaries Group". www.executiveoffice-ni.gov.uk. The Executive Office (Northern Ireland). Retrieved 16 October 2017. ^ "NI Employee Jobs – Public Sector – December 2007 – June 2011". Northern Ireland Quarterly Employment Survey Historical Data. Department of Enterprise, Trade and Investment. Retrieved 15 November 2011. ^ "NI Public Sector Jobs (Unadjusted) – June 2011". Public-Private Sector Tables. Department of Enterprise, Trade and Investment. Retrieved 15 November 2011. ^ "Ensuring Appointment on Merit and Safeguarding Ethics". Civil Service Commissioners for Northern Ireland. Retrieved 16 October 2017. ^ "NICS Code of Ethics". Civil Service Commissioners for Northern Ireland. Retrieved 16 October 2017.